In this photo, the first production P-8A, LRIP1-1, takes off from Boeing Field in Seattle on its way to Naval Air Station Jacksonville, Fla., where it will be used for aircrew training. SEATTLE, March 6, 2012 -- Boeing [NYSE: BA] on March 4 officially delivered the first production P-8A Poseidon aircraft to the U.S. Navy in Seattle. The P-8A is the first of 13 anti-submarine warfare, anti-surface warfare, intelligence, surveillance and reconnaissance aircraft Boeing will deliver as part of a low-rate initial production (LRIP) contract awarded in 2011. Following delivery in Seattle, Navy pilots flew the first production P-8A, LRIP1-1, to Naval Air Station Jacksonville, Fla., where it will be used for aircrew training. The Poseidon team is using a first-in-industry in-line production process that draws on Boeing’s Next-Generation 737 production system. All P-8A-unique aircraft modifications are made in sequence during fabrication and assembly. Along with production aircraft, the P-8A team also has built and is testing six flight-test and two ground-test aircraft. The flight-test aircraft are based at Naval Air Station Patuxent River, Md., and have completed more than 1,500 flight hours. A derivative of the Next-Generation 737-800, the Poseidon is built by a Boeing-led industry team that includes CFM International, Northrop Grumman, Raytheon, Spirit AeroSystems, BAE Systems and GE Aviation. 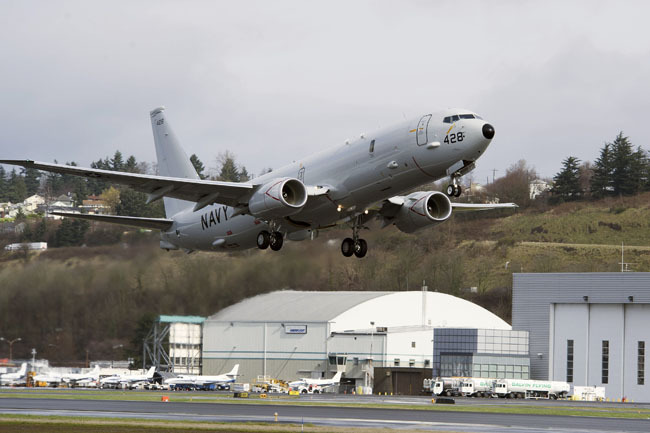 The Navy plans to purchase 117 Boeing 737-based P-8A aircraft to replace its P-3 fleet. Initial operational capability is planned for 2013. A unit of The Boeing Company, Boeing Defense, Space & Security is one of the world's largest defense, space and security businesses specializing in innovative and capabilities-driven customer solutions, and the world's largest and most versatile manufacturer of military aircraft. Headquartered in St. Louis, Boeing Defense, Space & Security is a $32 billion business with 62,000 employees worldwide. Follow us on Twitter: @BoeingDefense.